After bad weather lead to the event being postponed, the Southwest Missouri Fly Fishers clean up of Crane Creek will be held on Saturday, February 23. Meeting at the park will still be at 9 a.m. 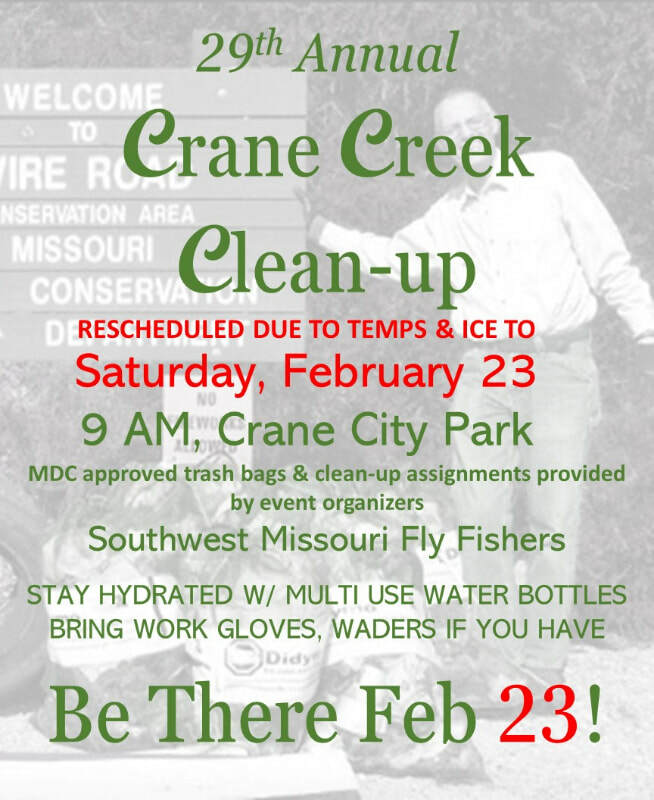 The Southwest Missouri Fly Fishers Association will host their annual clean up of Crane Creek on Saturday, February 16, and they are hoping to bring volunteers from the community out to help keep the creek healthy. The organization picked Crane Creek to clean up because of the wild trout in the creek. “There are a number of stories as to how they got there, but they are wild rainbow trout. There is no stocking of fish, so they are from natural reproduction. As fly fishers, we think it’s important to help protect them by picking up trash in and around the creek,” Goodwin said. Volunteers interested in helping clean up the creek are asked to meet at 9 a.m. on Saturday, February 16, in Crane City Park, where there will be a brief orientation. “We ask that those who have them bring work gloves and waders. We focus on the Wire Road Conservation area because the park itself is usually pretty clean,” he said. After gathering the trash to a central location, the Department of Conservation takes care of disposal. The clean up will conclude by noon.